BE SURE TO CLICK ON THE LAST PHOTO (WHEN SCROLLING THROUGH PHOTOS) FOR A VIRTUAL TOUR OF THE GETAWAY!!!!! Welcome to the Getaway at Banner Elk! Our home offers a king size bed in the master bedroom, along with an en suite full bath, with double vanity and walk-in closet. The guest bedroom features a queen size bed and twin size bunk beds, an en suite bath with shower. The kitchen is fully equipped with flat top, stainless steel, 5 burner stove, oven, dishwasher and refrigerator with ice maker. The living room offers a huge sofa with plenty of seating, a new 40in. flat screen TV with HD cable TV. Full laundry room with full size, front loading washer and dryer. 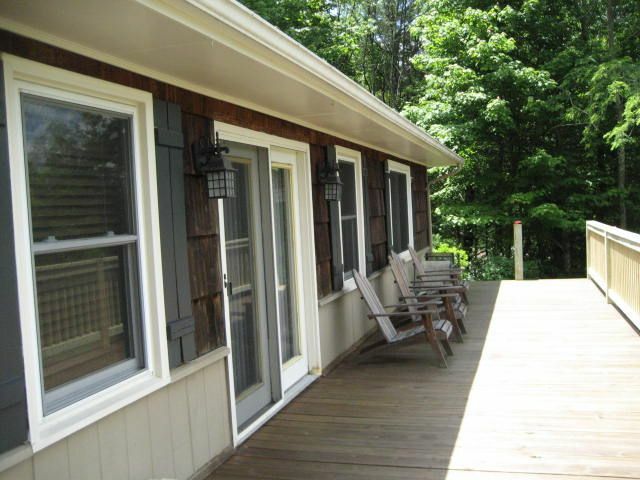 Outside you will find a huge deck with plenty of deck chairs, table for outside dining, fire pit and great views of beech mountain. Covered parking area for small car. Keurig Coffe Maker as well as regular coffee maker. Bring your Keurig Kups! Dining room table has 6 chairs and we have 2 bar stools, as well. Minutes from all the resorts in the area. Central to Beech and Sugar for Skiing, Snowboarding, Tubing, Sledding and Ice Skating. In the winter, the house is just minutes from Ski Beech or Sugar Mountain Resort. In the summer, you can walk to the town park, festivals, and restaurants. Golf is just a short 10 minute drive to Sugar Mountain's public golf course. Tweetsie Railroad, Grandfather Mountain, Blowing Rock, Linville Falls, Linville Caverns and other area attractions are all within a 30 minute drive.